Juna Bazar is one of Pune’s oldest markets, set up on Veer Santaji Ghorpade Road – opposite Chhatrapati Shivaji Maharaj stadium at Kasba Peth. The market is set up in the form of makeshift stalls, and only a sparse number of brick-and-mortar shops. Operational only on Wednesdays and Sundays, you’ll find a lot of really cool stuff here, but you will also have to bargain hard to get the right price. We paid Juna Bazaar a visit, and here are 6 unique things we found. This modern solar-powered lantern opens up into a bright enough light and has an additional torch on the reverse side. It also works on battery power, and can even be plugged in and charged on days when the sun isn’t out. We think it’s ideal for camping, or even for reading at your bed-side. We were told it cost INR 350 but were able to negotiate an additional 30% discount. At a tiny little antique-dealing stall, these silver-plated jewellery boxes caught our eye. 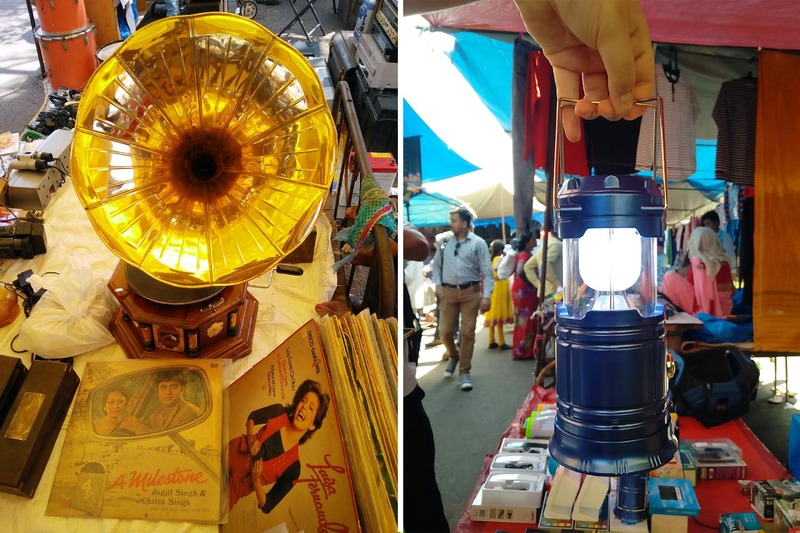 They’re legit antique – some in better condition than others – and priced between INR 600 to INR 1800. The name of the stall (though it isn’t displayed) is Royal Antiques, and they have a small brick-and-mortar shop attached as well. Contact: Royal Antiques +91 8793770082. It’s always useful to keep a basic set of household tools on hand, no matter whether you know how to use them or not. We found mini-sets priced at INR 250, and individual large tools (hammer, saw, screwdriver, wrench, etc.) from INR 50 onwards. If you’re keen on buying the large ones, we also found bright orange tool-boxes (with different compartments) for INR 700 (medium-sized) and INR 800 (large-sized) at the same stall. Audiophiles, pay heed – we found a restored, functional gramophone priced at INR 3500, as well as vintage records of Hindi cinema classics, each for INR 100. You’ll have to hunt through the pile of records to find what you like – but it’ll be worth it. The stall has no name, but you can contact them at +91 9049063352. If you love to grill your own food, these portable Hibachi-style grills are ideal for you. A small grill costs INR 800, and a larger one goes for INR 1500. Wood-handled skewers will cost only INR 100 for a set of six. The grills work on charcoal and are great for home-style BBQ, house parties, and to travel with. Towards the end of Juna Bazar, (near the main traffic signal), you’ll find a lot of brassware vendors. We found a set of beautiful antique cut-glass and brass cupboard handles for INR 500, animal figurines for various prices (bargain, bargain, bargain! ), vintage animal-shaped brass locks (with keys) for INR 1800, a brass masala box set for INR 900, and a really neat brass embossed beer mug set for INR 3000 (or INR 500 each). We suggest you approach different brassware vendors and compare prices and pieces before you decide to buy – most have similar items for sale, and some are better than others. Carry a bottle of water, and something to cover your head with – the sun is harsh here. If you feel thirsty, there are also stalls selling nimbu-pani, where you can quench your thirst for just INR 10 – 15 per glass.